Recipe for Lemon Thyme Peach Galette, fresh peaches coated with honey, seasoned with lemon thyme, and baked in a buttery crust. Peach pie flavors in an open face galette that tastes just like summer! Sift flour into bowl, whisk in sugar and salt. Add butter pieces and begin squeezing them into the flour , mixture with your hands. Continue working the butter until it resembles cornmeal. In a large bowl whisk together all ingredients except peaches. Next gently add the sliced peaches and stir with a wooden spoon to coat them. Preheat oven to 375 F (190 C) Line cookie sheet with parchment paper. Roll out dough onto floured surface to a 10-12" circle. Place dough onto cookie sheet. Assemble peaches onto the crust leaving a 2 inch border. 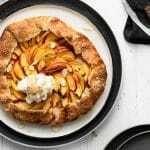 This galette used a spiral of overlapping peaches, but you can arrange them any way you choose. Fold dough over and crimp to enclose the peaches. This will create an open center with a “pizza crust” look. Brush the folded crust with egg wash and sprinkle with sugar. Bake for 35-30 minutes until crust is golden brown and peach juices are bubbling. Remove from oven and allow to cool on pan for 10 minutes. Juices will look runny, but they will solidify as the galette cools. Transfer galette by sliding parchment paper off the cookie sheet and onto a wire cooling rack. Serve with ice cream, whipped cream or crème fresh. Sprinkle with chopped almonds. Drizzle on some honey and dig in!